We seem to be having some travel issues this Fall, as we arrived a little later than we would have liked down in Hartford for our Trinity match. At one point, as we were "touring" campus, we actually stopped and let out a few players that needed to get to the training room because we could see where we needed to be, but couldn't actually find the way to drive there. Since it was lightly raining, the rest of us decided to stay with our driver and attempt to find the actual entrance to the gym, but we sent the other heading out across a turf field to the gym waiting beyond. Eventually, we made it, and for most teams, it was still fine timing-wise, but since we like to arrive places very early, we felt a little behind schedule. No matter, game time comes when it comes, and we were ready! 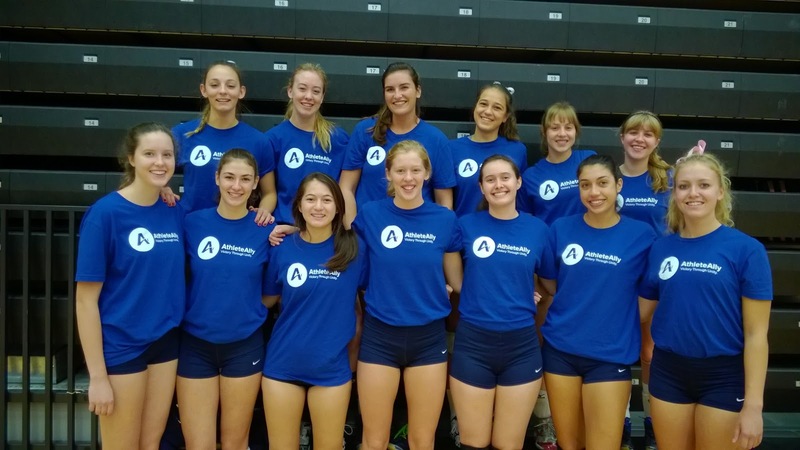 We were also celebrating Athlete Ally Week, so we wore our new Ally Tees to warm up in for both matches this weekend. For those that aren't aware of the organization "Athlete Ally", it's mission is to make athletics a safe and welcoming space for all people, regardless of sexual orientation. We're hoping to raise awareness of this issue by supporting the cause and wearing our tee shirts proudly and around campus and the community to celebrate Ally Week this week, and every week. We cruised to an easy victory in set one, and slowed down a bit in set two, but after playing back and forth for a bit, we opened up a wide margin to win 25-19 in the 2nd. Heading into the 3rd set, however, we couldn't seem to put them away. Trinity was very scrappy and kept many balls alive that we thought were down, and they started putting the ball down past our defense, and we found ourselves down 22-23. Three points later, we emerged victorious in straight sets--a block by Becca/Mel, sandwiched between two powerful kills by Becca that both overpowered Trinity's block, coming down in front of them and the net, and the match was ours! We hit .301 for the match, which was great to see. 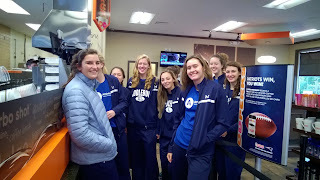 The next day we traveled the short ride to Wesleyan, which allowed us time to sleep in, study some in the morning, and still make our Dunkin stop! We traded points early with Wesleyan, being tied last at 10-10, when we pulled away to go up by 6 at 20-14. We didn't finish cleanly, and they closed the gap to 24-22 before we notched the final point for the first set win. Set two was very tight the whole way taking us up 21-19, and then Becca scored a kill that sent Hannah to the service line, and her first serve was an ace, and then we scored the next two points for the 2nd set victory. The 3rd (and final) set was again back and forth to a 12-12 tie, and then we just steadily pulled away for the 25-18 set, and straight-set sweep. 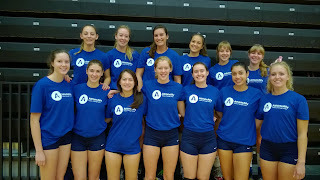 Emily had a match high 23 digs, Becca led all hitters with 19 kills, and Hannah averaged over 10 assists per set. Claire came through with a match high 4 service aces, and both Mel and Eliana had two block assists. It was a quick turn-around to play again on Tuesday on our home court against Skidmore. We came out strong and took a 5-1 lead and never looked back as we took the first set 25-17. The 2nd set, however, proved to be quite a different story, even after starting out in a similar fashion. We jumped out to a 6-0 lead, only to see them come storming back trading points, and then going on a 5-0 run themselves to take a slim lead at 13-14. We traded points again, and both teams would take a slim lead, only to see it shift back again. They finally went up 22-24 as we faced two set points against, but Charlotte came through with a kill from the back row, sending Becca to the service line, where she would stay until the match ended. Isabel subbed in to the front, and quickly scored a thundering kill down the line to tie the game at 24-24 before Eliana and Mel blocked their big hitter and then a well executed tip by Isabel finished off the comeback win in set 2. The third set was all us as we got out to a 7-1 lead, and cruised on to a 25-13 win for the straight set match win again. We hit over .300 again, and both Becca had match highs for service aces, kills, and digs, while Hannah shared the service aces high with 3 also, while getting 40 assists in the match for over 13 assists per set. Eliana and Mel shared for match highs in the blocking category, each with 3 block assists. We now face two big Conference rivals in "The Purples" this weekend as both Amherst and Williams come to play in our gym! We're excited about the opportunity to play two highly ranked teams in New England, and to show them and ourselves just what we're made of! 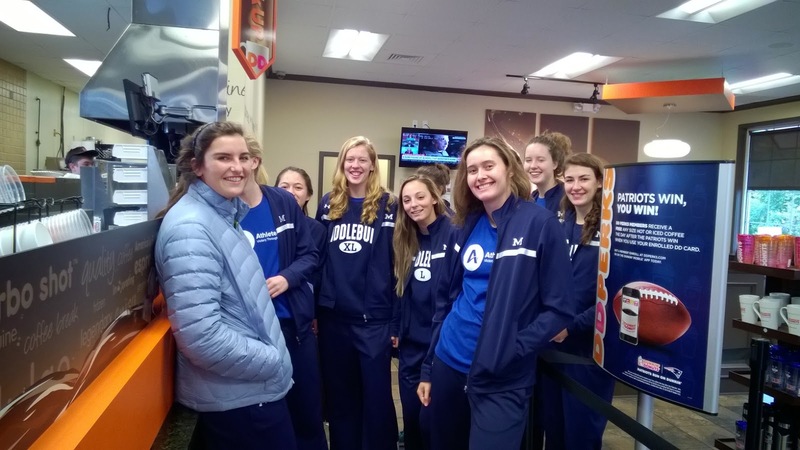 Should be a fun weekend, and it's also the weekend we're celebrating Parent's Weekend for our Team, and also the Inauguration of our new College President, Laurie Patton, so it should be a very festive, and fun weekend of MIDD action!